In Fangirl, Cath is just starting college, and she’s more comfortable in her online world. She writes Simon Snow slash fanfiction. Simon Snow is like a Harry Potter stand-in, except in a world where Harry Potter also exists. The Simon Snow series by Gemma T. Leslie is eight volumes long, with the eighth soon to be published. Cath is working on her novel-sized fanfiction, Carry On, Simon, and wants to be done before that eighth book is out. Carry On is not Carry On, Simon. In fact, the sections of Carry On, Simon that are in Fangirl are not in Carry On. 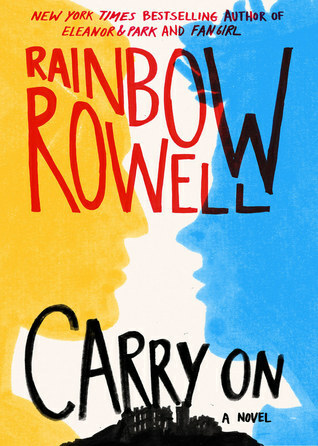 But Carry On is, essentially, fictional fanfiction of a fictional fantasy series. Except it’s also a standalone, and you don’t need to know anything about the Simon Snow world as presented in Fangirl in order to read this book. You don’t need to have read Fangirl, either. In some ways, you could flat-out call this a Harry Potter fanfiction. Simon = Harry. Baz = Draco. The Mage = Dumbledore. Penny = Hermione. Ebb = Hagrid. Watford = Hogwarts. Etc. At the same time, this isn’t Harry Potter fanfiction, and it doesn’t feel at all like a Harry Potter ripoff or derivative. Harry Potter itself already draws on many epic fantasy tropes – powerful magicians, evil magicians, unseen/unknown forces, a blundering hero and a smart sidekick, a hero quest, etc. Carry On takes some of the same tropes, changes them around a bit to make unique characters, all with a respectful nod toward Harry Potter. And it totally works. I could not stop smiling as I read through this book. Yes, I already knew Simon, Baz, Agatha, Penny, and the Mage from Fangirl. I already knew Cath’s non-cannon pairing of Simon and Baz. I was a tiny bit familiar with the magic system and world-building, but a tiny bit is all we get in Fangirl. Carry On fleshed everything out. There was no need for prior books or prior knowledge, but for me, it was like stepping into a world that I’d already gotten a little peek at, and discovering that it was so much more than I’d known. Because as I said, this may be like a Harry Potter stand-in for Fangirl, but it’s a whole unique and wonderful thing here in the real world. so much more. Every single word. This is my third book in a row that I just loved to pieces and wanted to hug to bits. I can’t recommend this one enough. PS – I could easily see fanfiction written about Simon Snow and the world of mages now. Which is both ironic and happy-making. This entry was posted in 2015, Prose, Young Adult and tagged favorite, Harry Potter, humor, LGBTQIA, speculative. Bookmark the permalink. I did love Agatha’s irritation with people using magic when they could just use…well, tape, for example! Glad we agree on how good this book is! Jason thought the tape line was hilarious. That was something that bothered him about Harry Potter, that none of the witches and wizards, even those who grew up in muggle families, ever thought muggle technology was better than spells. I will get to this book soon! Everyone seems to be raving about it, which makes me endlessly happy. I was so worried it wasn’t going to work.